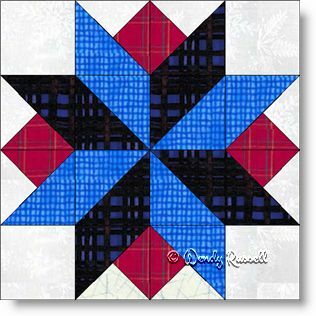 The Rainy Day quilt block is a great choice for moving on to increasing your skills in precision, with the introduction of quarter square triangles in some of the patches. Actually, the unit you will be making is sometimes called a three quarter square triangle patch as the unit is made up of three triangles, rather than four. Look closely at the illustrations and you will understand what I mean. This four patch block is not as common as other quilt blocks, and really, I have no idea why it is not. Perhaps quilters tend to stay with familiar blocks to work with. The sample quilts illustrated show two very different looks, all the while using the identical block in each quilt. Let your own creativity begin!